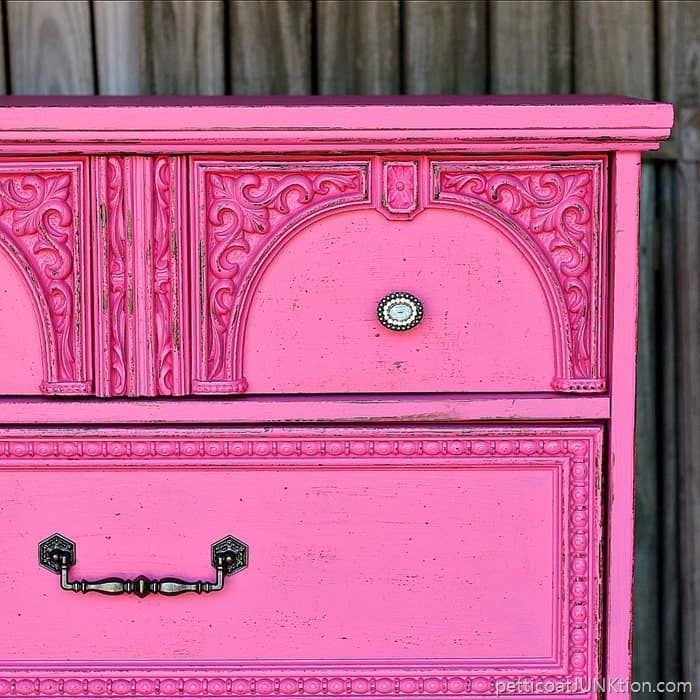 In this tutorial I’ll show you guys how to paint mdf furniture and give it a distressed layered paint look. 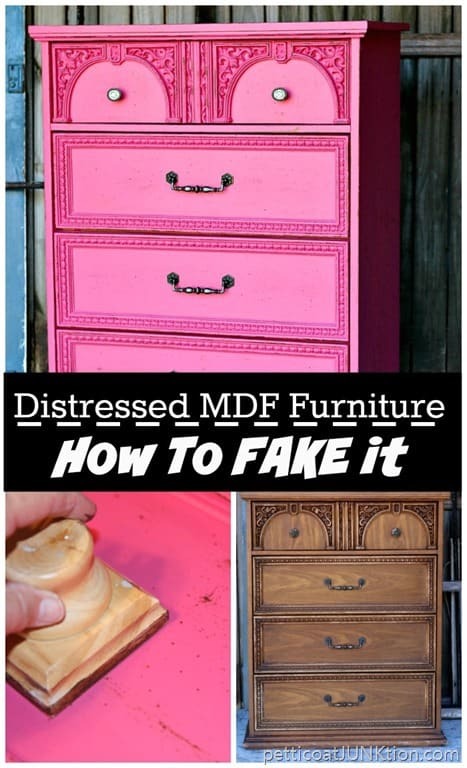 I think all of us at one time or another have had experience with mdf furniture. Probably not a good experience. 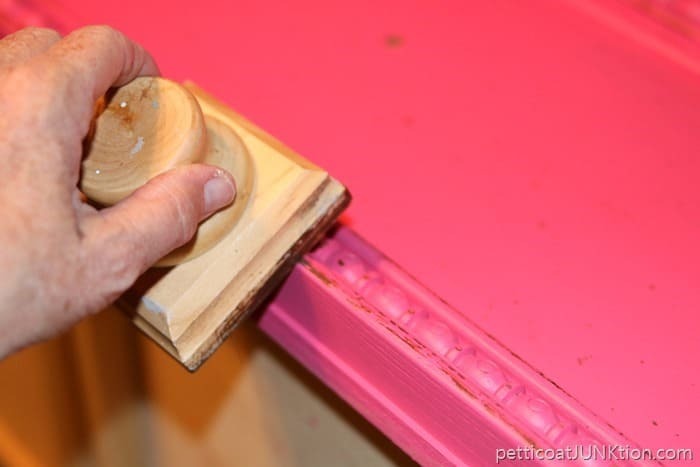 If mdf furniture is in good condition, meaning no water damage or major scratches, this technique will turn the piece into a real beauty. You’ll never know it’s mdf masquerading as wood. 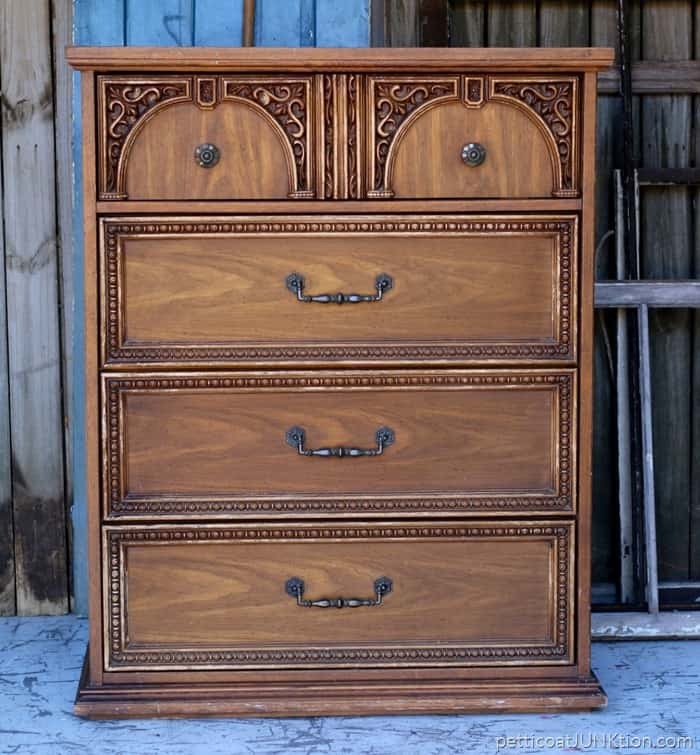 I bought this chest at the junk shop I talk about all the time. It was only $35. 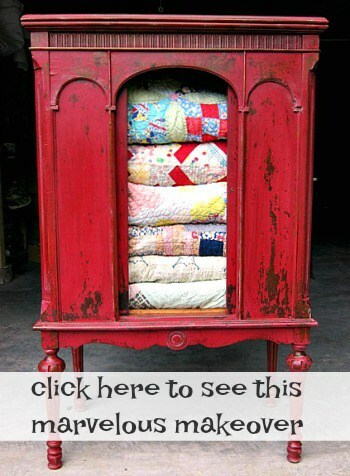 Not only is it made of mdf, the detailed pieces on the drawer fronts are plastic….including the beaded details. A bit of paint can work miracles. I knew the details would pop if I could figure out a way to highlight them. The paint is a custom mix….by me. I wanted to paint the chest a pretty coral then realized the coral paint can was mostly empty. I found a can of hot pink in my paint stash and added the tiny bit of coral paint I had left over. The coral cut the pink, pink, look. Once the paint was dry I pulled out my FolkArt layering block. I have to admit I had my doubts about the block….before I used it. It’s one my favorite paint tools now. 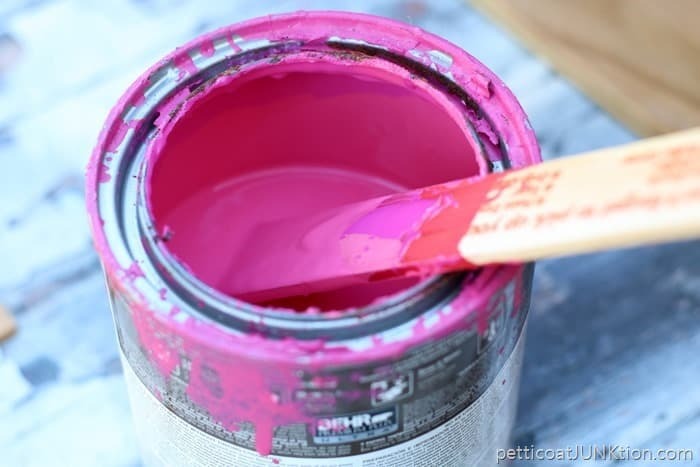 I apply a thin layer of paint to the block using a paint brush. Then I run the block over the areas I want to look distressed. I reapply paint to the layering block as needed. The detailed beaded areas were a little iffy. I ran the block over the top of the beads and then down the sides. 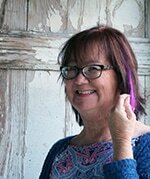 Remember there is no need to make the “distressing” or layering look perfect. Now this is the cool part. I brushed paint onto the block then wiped most of it off until there was a really thin layer of paint. Next I ran the block over the surface of the drawer fronts. We all know that there are little imperfections in just about everything. The places on the drawer where there were bumps or unevenness picked up the brown paint. With the paint job finished I moved on to the hardware. I decided to use the original pulls on the bottom three drawers. 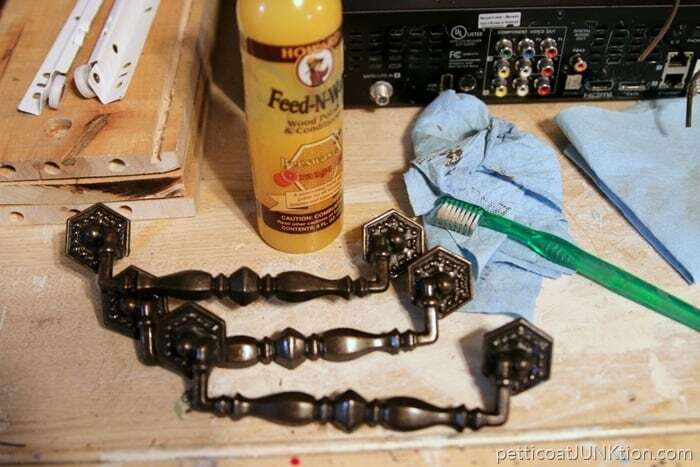 A cleaning with Howard’s Feed n Wax shined them right up. The wax is for wood but it shines up metal too. For the top drawer I bought fancy pulls at Hobby Lobby. I love how the “distressed” details turned out. This piece is a really beauty now. I wish you guys could see the chest in person. 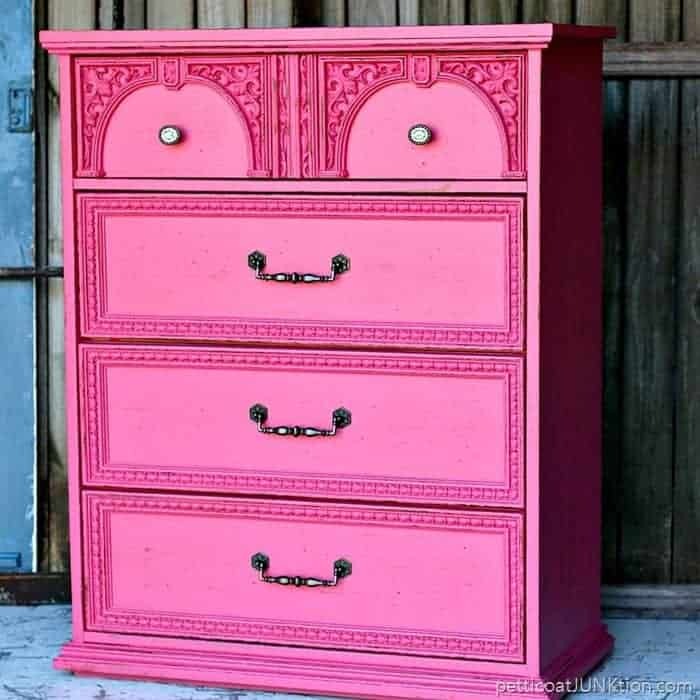 The details really look distressed and the specks on the drawer fronts look like worm holes. 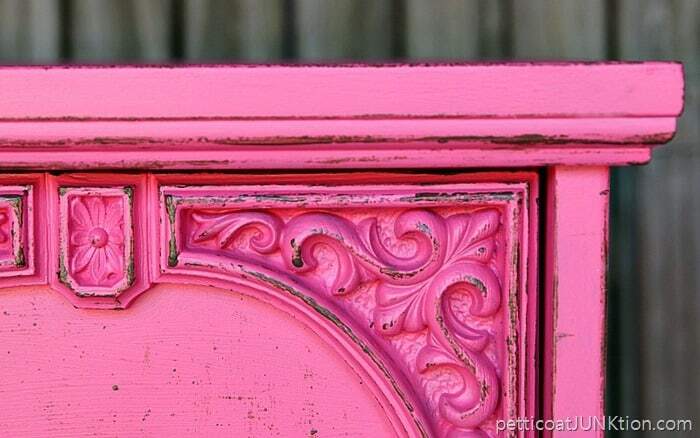 How to create a distressed layered paint look on mdf furniture. If you have water damaged mdf furniture I have a technique for that to. 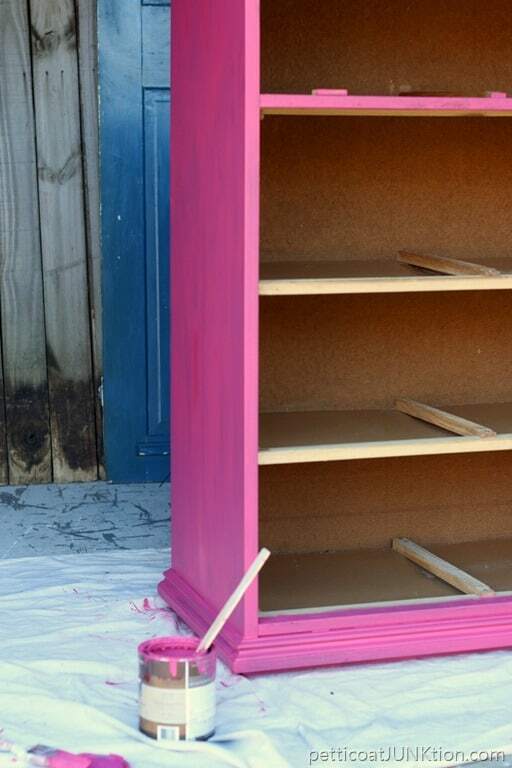 You can see it here…Painting Damaged MDF Furniture. In the middle of the paint project I walked outside the workshop and caught the JTS on the roof cleaning out the gutters. He’s a keeper although he sure makes me nervous sometimes. What do you guys think of the paint project? Do you have any mdf furniture? I took the chest to my booth and it sold in just a few days. Wish my projects always sold that fast. 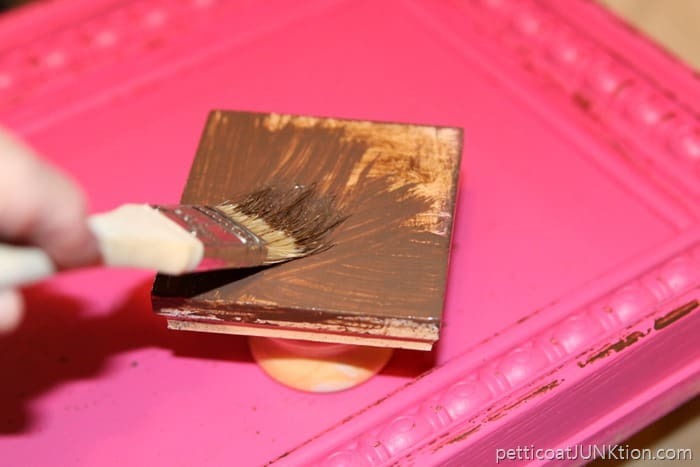 I have another post using the distressing block here….How To Fake Distressed Paint. I have always wondered what to do with mdf fiurniture. I am not afraid of messing with it now after seeing what you did with it…very, very nice. I had no idea there was a painting block like that. I just love how there’s always someone out there that comes up with great tools that make life easier for the rest of us ? Wow, that really turned out gorgeous!! Kathy, this is spectacular! You’re so clever, love your “can do” attitude! The painting block really made a difference-we learned something today (always do when I visit your blog). 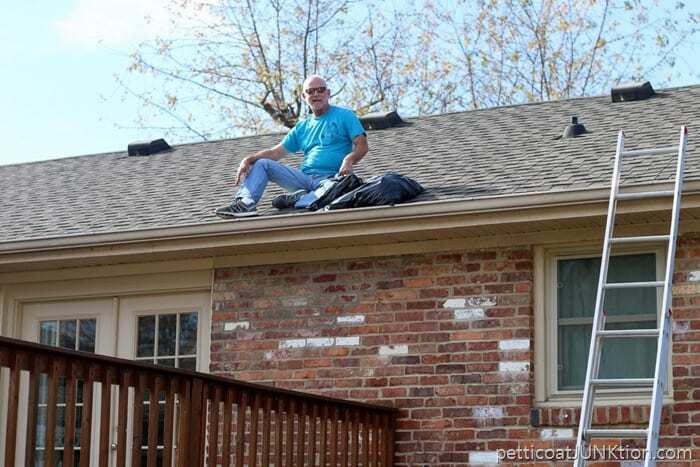 As for the roof-sitting Hubs, my dad used to tie a rope from him to the chimney. Not a perfect method, but it helped. Gracie, I searched for the layering block, so I believe this is the link..
Wow… Will certainly not turn up my nose to MDF anymore! Love the block! Will have to find one! Beautiful piece! Marie, I think this is the link, not sure if we can get it in Canada though..
I’m heading down next week..